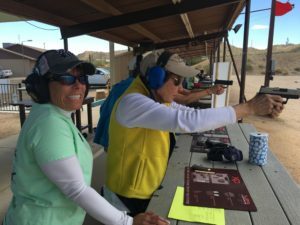 Home // At The Range // 4th Annual Desert Flower Ladies Day At The Range is in full bloom! 4th Annual Desert Flower Ladies Day At The Range is in full bloom! Spring has sprung early in the desert, which means planning for Rio Salado’s Desert Flower Ladies Day must be underway. And it is! Rio Salado Sportsman’s Club is again bringing you our 4th Annual Ladies’ Day at the Range. Mark your calendar for SUNDAY, April 29th! Registration is already open. Visit www.herhandgun.com/2018-ladies-day for all information. So grab your female co-workers, friends and family members interested in learning to shoot and get registered for this special day! The event is already half full! Hope to see you soon – at the range.